High resolution PNGs are used to develop GUIs Icon in the pass. With the growth of high resolution screen, designers have to use a double or triple size of the original icon in order to achieve the sharpness and pixel perfectness in the high res screens. Today, vector icons has become popular today as well as the acceptance of the use of SVG Icons. Thanks to the modern browsers are now support rendering of svg icons. 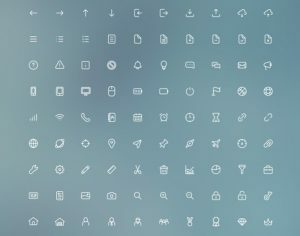 Here I have put together 50+ different types of GUI icons that I personally like it.